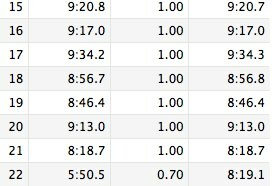 Having decided to run the Vermont 50 Mile next Sunday, this week's training was a little "light"....logging only 43 miles. AM - 3.00 miles in 27:00. PM - 3.00 miles in 30:00 (treadmill). 6.00 miles in 51:31 - .5 mile warm-up and cool-down. 10 x 400m with 400m easy in between. 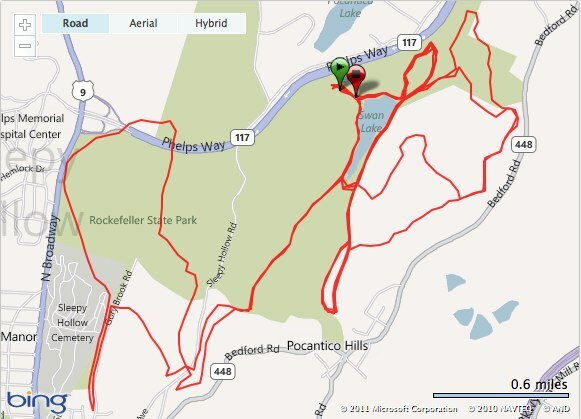 21.70 miles in 3:30:58 at Rockefeller State Park - An overall great run. Spent the first 14 miles with Kristen, at about 10:07 overall pace. Picked up the pace for the last 7 miles. 6.30 miles in 1:04:22 at Rockefeller State Park - Nice, easy run with Steve, who is still out there logging another 9 miles or so.